Artisans attending this year’s Adäka Cultural Festival in Whitehorse have each come up with unique ways of celebrating this year’s theme of life in the circumpolar north. Glasswork artist Rosalind Mercredi is no exception. Underneath an artisan’s tent behind the Kwanlin Dün Cultural Centre, Mercredi facilitated a collaborative glass mosaic project during the festival’s seven-day span. Festival participants and fellow artisans were encouraged to contribute a design of their own to the mosaic relating to life in the north. The Arctic Circle is represented with pieces of triangular green glass around the sun at the centre of the mosaic, with a ring comprised of the four colours of the medicine wheel also helping to frame the northern imagery included in the artwork. 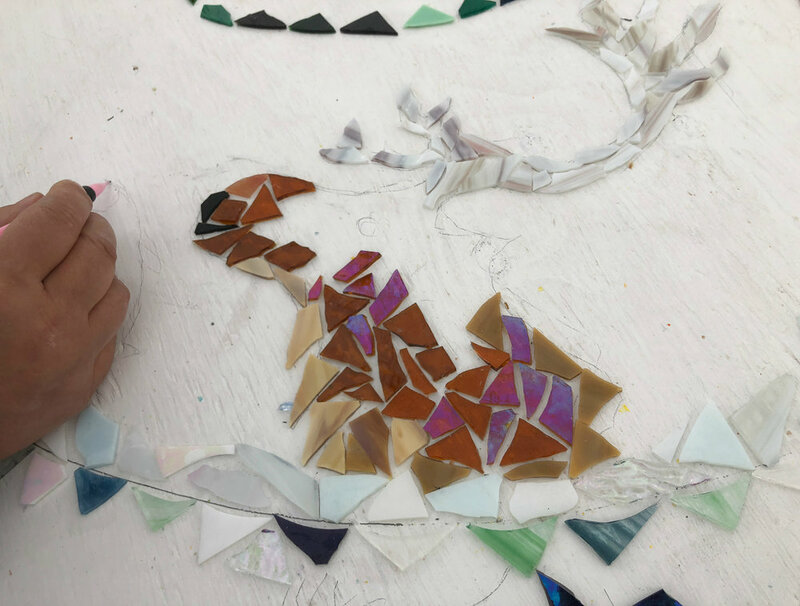 “I’m thinking we should do a teepee, maybe an igloo, whatever the traditional housing is in Siberia,” Mercredi says as she works to complete a glass caribou on the mosaic. Mercredi, a glasswork artist living in Yellowknife, has been making art from glass for about 20 years. Having started out creating artwork with stained glass and fused glass, Mercredi says that the creation of her glass mosaics began as a way to make use of pieces of spare glass left over from other projects. Mercredi sketches a whale onto the mosaic board that will later be created out of glass, while other participants add to the artwork. The northern imagery depicted throughout the mosaic, surrounded by the Arctic Circle and medicine wheel, is meant to demonstrate the interconnectedness of life throughout the circumpolar north. “While people work on it, they talk and they share,” Mercredi says about the process. 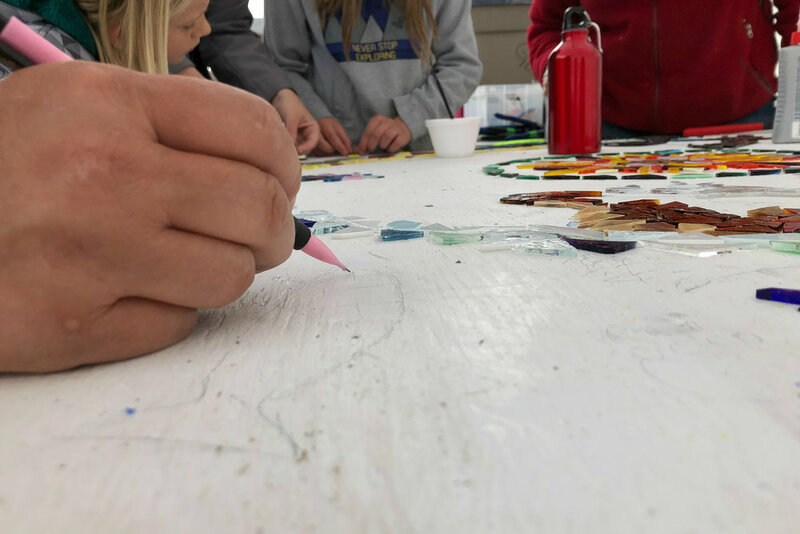 Once participants have finished creating their piece of the mosaic, they write their names onto the board and glue a clear piece of glass overtop to preserve their contribution. “We’ve got a mosaic hanging outside a gallery in Yellowknife that we did during a festival a couple years ago, and people will come and look for their names sometimes when they’re older,” Mercredi says. Mercredi continues to add to the mosaic, which she will be grouting once the Adäka festival concludes on July 5. The mosaic will stay with the festival when Mercredi heads home to Yellowknife on July 6. Mercredi welcomes anyone to try their hand at contributing to the mosaic. Looking at what has been added to the board so far, Mercredi can identify who has added which elements to the project.